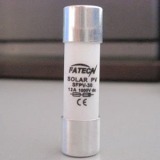 ﻿ FATECH introduced solar fuse-link and fuse holder for Photovoltaic (PV) systems - Comany News - Fatech Electronic CO., LTD. The range of 10×38mm fuse links are specifically designed for protection of photovoltaic (Solar Panel) strings. These fuse links are capable of interrupting low over-currents associated with faulted photovoltaic string arrays. Welcome your inquiry by phone or e-mail any time.